Maintaining parking lots and roadways is an important step towards creating positive responses from customers and constituents. Hiring the right commercial paving contractors and implementing a routine maintenance program will help keep costly repairs down. 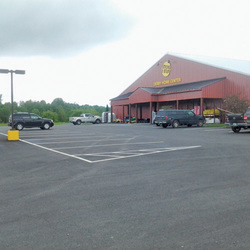 Gray's Paving and Asphalt Plant has over 30 years of experience helping businesses in the Northern Vermont area manage the maintenance and repair of parking lots and roadways. Our solutions deliver cost-effective results that improve the longevity of pavement and overall appearance of businesses. Contact us to request a free written estimate for your commercial paving project. Asphalt is used in many of different applications because of its strength, durability and cost-effectiveness. It is the most used material for parking lots in Vermont and New Hampshire because of its ability to withstand heavy loads and, when maintained properly, lasts for many years. To keep your asphalt parking lot or roadway looking its best for the longest amount of time, it is important that you maintain a pavement management plan. This plan should include routine inspections and ongoing preventative maintenance. We've put together a list of common asphalt maintenance procedures that you might consider adopting. Contact us if you have questions about any of these items, or to request a free written asphalt paving estimate. ﻿A common remedy for asphalt pavement with potholes is patching. Potholes usually happen when water seeps into asphalt through unsealed or improperly sealed cracks. When the water freezes, it expands and makes the crack bigger. A void is left when the ice under the pavement melts, causing the surrounding pavement to fall into the void and forms a pothole. Asphalt repair and patching includes filling the affected areas with hot or cold asphalt mix, depending on the season and location of your site. A Gray's Paving consultant can assess your specific situation and recommend the best course of action. 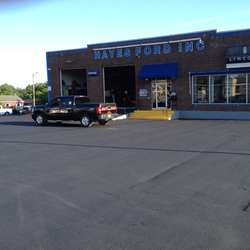 When asphalt ages, its appearance and effectiveness diminishes over time. Hairline cracks form, spread and deepen in the asphalt. Without proper maintenance, water may enter through cracks and potholes of various sizes may form, weakening the substrate. In these types of situations, the most effective form of repair is to remove and replace the deteriorated area of asphalt. The process consists of several important steps to ensure that the repair is performed properly. The cost for asphalt removal and replacement depends on your location site, the amount of grading and substrate work required, and other factors specific to your site. Asphalt resurfacing (or overlay) is required in more severe cases of asphalt failure. When you see large alligator areas (cracks that interconnect in a series of blocks that resemble the skin of an alligator) and/or grade depressions (standing water/puddles on the pavement), you should consider having your pavement resurfaced. In these cases, asphalt resurfacing is a cost-effective and long-term solution. Asphalt resurfacing involves several steps, including cleaning and preparing your site, leveling asphalt of low areas, grinding all transitions, adjusting drainage structures, and any other step unique to your site. 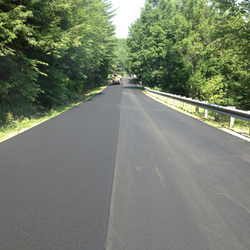 The asphalt aging process begins right after freshly laid Hot Mix begins to cool. When oxygen and water combine with the pavement's asphaltic binder, a chemical reaction occurs. Initially this process is necessary for the pavement to become hard and firm. Later, if this process is not restricted, further deterioration of the asphaltic binder will take place and reduce the pavement to a layer of loose stone. Elements that are damaging to asphalt include: oil, gas, sun oxidation, salt, water penetration, and cold or hot weather. However, with routine inspections and ongoing maintenance, you can protect your asphalt investment. Sealcoating your asphalt will slow deterioration by protecting against the damaging elements. At Gray's Paving, we recommend applying a sealcoat approximately 12 months after the initial application and then about every 24 to 48 months after.